The Salon Culinaire 2017 is “Hospitality Qatar’s” signature culinary showcase that celebrates gastronomic excellence and creativity. The Salon features competitions and live demonstrations dedicated to top local and international chefs to showcase their skills and artistry across various scrumptious categories. 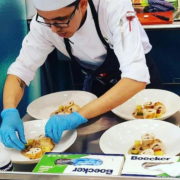 Best of the best chefs from Doha’s culinary society showcased their talents at Salon Culinaire. A total of 270 chefs from various hotels across Doha participated in the competition. There were different categories of competition from live cooking to team cake making. The jury comprised of eleven expert chefs from various countries headed by World Chefs President Thomas Gugler from Germany. Jigar participated in a live cooking competition which is one of the toughest categories. Jigar’s award-winning dish was Truffle Chicken Roulade with cranberry liver sauce, confit potatoes, shitake mushrooms, Brussels sprouts and baby carrots. Jigar met the current batch of first-year students to share is industry experience so far. The students also got a chance to ask him questions related to a career in hospitality.